In the latest development in the rapidly escalating situation in North Africa, the Tunisian President has been forced out of power, a new government formed and a state of emergency declared in the face of what can only be described as a working class rebellion. At the time of writing, a “national unity” government has been formed and security forces have attempted to crack down on the movement while the concessions such as the release of political prisoners are offered. Nonetheless, the demonstrations continue. The international response to the uprising stands in stark contrast to that which greeted the 'green' demonstrations in Iran, in the case of Iran, we saw deafening condemnation, with Tunisia, deafening silence. The US, which condemned the Iranian government in the strongest terms for the repression it unleashed, has said that it “is not taking sides” between the government and protesters being shot in the streets. Clearly, demands for democracy and human rights do not apply to dictatorships aligned with the US. Britain has condemned the Tunisian protesters for their 'violence', joining official enemy Col Muammar Gaddafi in expressing their shared contempt for ordinary people taking their lives into their own hands through collective action. The immediate catalyst which initiated events was the attempted suicide of Mohammed Bouazizi on the 18th December. The 26 year old university graduate, who had doused himself with petrol and set himself alight in the city of Sidi Bouzid in central Tunisia, would succumb to his injuries in the following month (but not before a cynical visit to his hospital bed by President Zine al-Abidine Ben Ali). Bouazizi's self-immolation in front of a government building was a desperate protest which summed up the dire prospects facing young people in Tunisia. Unable to find work, he had sold vegetables on the street illegally. The confiscation of his produce by the police had been the last straw. Tunisia, frequently held up by interested Western governments as a model of stability in the Arab world, is racked by unemployment, inflation in the price of essentials, and widespread corruption. Unemployment is as high as 25% in many areas. It is particularly acute amongst university graduates – a situation repeated in neighbouring countries such as Morocco and Algeria, which has also been affected by unrest. Protests and strikes are uncommon, and a previous wave of strikes and demonstrations over unemployment, housing, education and health in 2008 in the city of Gafsa in the South-West was met with heavy repression. Protesters and strikers were murdered, and many – including journalists covering events – were jailed arbitrarily as “ringleaders”. The state acted swiftly to prevent working class unrest spreading nationally, which has now materialised three years later. Repression has continued unabated since, but the brutality of the response to current events has only hardened the resolve of those involved. 21st December – Riots in the central Tunisian town of Menzel Bouzaiene. Police guns and teargas are met with molotov cocktails. At least one demonstrator is shot by police. 24th December - Demonstrators in Menzel Bouzaiene burn down offices of the ruling Constitutional Democratic Rally party, a national guard post and destroy three police cars and a railway locomotive.1 They set up barricades outside the police station. Mohamed Ammari, 18 is killed by police. Chawki Belhoussine El Hadri, 44, would later die of injuries received from the police. 25th December – Protests reach Tunis, held in solidarity with the uprising in Sidi Bouzid. 26th December – A second, larger protest is held in Tunis. It is attacked by police using truncheons, and throwing stones.2 The police response is overseen by the Minister of the Interior in person. The injured are prevented from reaching hospital by the police. Clashes last for a couple of hours. 27th December – 1,000 rally in Tunis. 28th December – Security forces attack a rally organised by the Tunisian federation of labour unions in Gafsa, the site of large-scale struggle three years earlier and a centre for the mining industry. -300 lawyers protest in Tunis, with at least two arrests. One of the arrested lawyers is tortured in custody. -High school teacher's union demonstrates outside the ministry of education. 29th December & 30th December – Police break up demonstration in Monastir. Protest in Sbikha is attacked by police. -Demonstration in Chebba broken up, at least one demonstrator hospitalised. 31st December – Police shoot demonstrators in Bouziane, one protestor, an unemployed graduate, is killed. -Clashes with police in the towns of Tela, Sfax, and Om Laarais. -Student demonstration in lycée de Gronbalya, Tunis. -Hackers take down several government websites, apparently in response to repression of attempts to report on the strikes and demonstrations. -Demonstrators in Cairo declare their solidarity with the uprising in Tunisia. 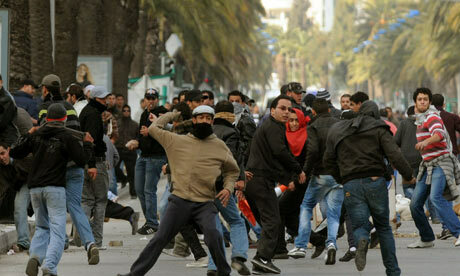 4th January – Demonstrations are reported in Thala, 250 Kilometres west of Tunis, leading to clashes with police. Initiated by students from the four main colleges in the town, the protest draws in the unemployed. After it is attacked with tear gas, police besiege the colleges with the students and teachers still inside. -Students demonstrate without interference in Sidi Bouzid. -A sit-in is held in the Prep Institute of Civil Engineering by students in Tunis. -Protesting students attacked with rubber bullets and tear gas in Sousse. -Armoured vehicles deployed in Thala, homes and markets raided. 6th January – Lawyers stage national strike. 8th January – More protests in Tala, close to the Algerian border. Police massacre 6 demonstrators. 9th January – Two demonstrators, Chihab Alibi and Youssef Fitour are shot dead by police in Miknassi. 12th January – General strike in Sfax, on the Mediterranean coast, called by the Tunisian Workers' Union. Large numbers of protesters gather in the centre of the town. 14th January – State of emergency declared, gathering of more than three people banned. Tanks deployed. - Tens of thousands fill Habib Bourguiba Avenue in Tunis. Ben Ali promises elections within 6 months, then flees the country, finding refuge in Saudi Arabia. Tunisia's prime minister takes control. 15th January – Prisoners rise up in two jails, leading to the deaths of 42 people in a prison in Monastir. In Mahdia soldiers kill 5 prisoners. 17th January - “National unity government” formed, various old regime figures are joined by those from the opposition. It is headed by Prime Minister Mohammed Ghannouchi, and promises to free political prisoners, ease restrictions on the press and hold new elections. Nonetheless, the protests continue. -French photographer killed by Tunisian Police. -Official death toll is put at 78. -Protests continue, police fire on protesters and deploy teargas in Tunis. One of the most significant aspects of the uprising thus far has been the speed with which it has transcended national boundaries, as people in neighbouring countries drew lessons from one another. We know of demonstrations in various parts of Algeria, there have been reports of protests in Libya, and self-immolation protests have taken place in Egypt and Morocco. Demonstrations have erupted in neighbouring Algeria, with the immediate cause appearing to be the spike in the price of many essentials of 20-30% at the end of the year. More long-term issues are, like in Tunisia, unemployment (above 20% amongst the under-30s), and the lack of housing, which is an acute problem in urban areas. 29th December – Demonstrations in the Algiers suburb of Les Palmiers over the lack and quality of housing. Police attack the demonstration, arresting 29. 52 police are reported to have been injured in the fighting, as residents set up burning barricades and threw molotov cocktails. 3rd January – Tipaza hit by protests, roads blocked. 5th January – Barricades set in the Bab el Oued area of Algiers, police station stoned. 6th & 7th January – Two nights of rioting in Algeria, pitched battles in Algiers with demonstrators setting burning barricades and fighting police with fireworks, molotov cocktails and machetes. Police intensify repression. 7th January – Riots break out in Annaba, battles with police continue all night. A government office is ransacked. The attempts of Imams to quell the uprising by calling for “calm” during Friday prayers fail. 8th January – Two killed by police during riots – one in Ain Lahdjel, claimed by police to have been shot during an attack on a police station. The second was killed after being shot in the head with a tear gas canister in Bou Smail. A third death was announced as the result of a fire in a hotel. 17th January – Four self-immolation protests reported. Information on the events in Algeria in mainstream sources has been limited since the week beginning 10th January; it is unclear whether this represents a demobilisation of protests or intensifying police repression. Demonstrations over housing and standard of living issues have been reported in Libya. Much of this information has been disseminated over the internet via Facebook, Youtube and Twitter, and much has been simply rumoured due to the tight control over information in the country. Protests erupted on the 14th of January over housing issues in various cities and continued for several days. On the 15th of January hundreds staged a mass squat of 800 vacant lots in Bani Walid in protest against the chronic lack of housing. Likewise 600 are reported to have occupied a residential development in Benghazi. Videos posted on Youtube showed demonstrations in Bidaa, Darna and Sabhaa. The police appear to be attempting to prevent the situation escalating along lines similar to Tunisia by avoiding large, violent crackdowns. A working class uprising – how far will it go? The fundamental class nature of the protests in North Africa is undeniable. In Tunisia, Algeria and Libya a generation of proletarianised youngsters have led mass protests, the immediate reason for which has been their desperate standard of living in countries which support a wealthy and transparently self-interested ruling class, less schooled in the modern techniques of bourgeois self-justification than their Western counterparts. The same issues are repeated in countries across the region. We will attempt a brief and preliminary survey of the class aspects of events here; again due to restrictions on information and rapidly developing events this survey is necessarily incomplete. The uprisings in Tunisia and Algeria have involved the expropriation of goods from supermarkets, shops and warehouses during mass demonstrations. This is to be expected ; one of the immediate catalysts for the uprisings was the cost of essentials rising rapidly, with scarcity compounded by security forces shutting down the country. Moreover, during situations where working class people are becoming aware of their own power, respect for the nicities of commodity exchange evaporates, especially when money (or the lack of it) limits their access to the essentials of life. Such expropriations are a feature of all proletarian uprisings, as is the line on "violent looters" spun to justify brutal crackdowns. Information on the extent to which strikes have formed part of the movement in North Africa is limited. We know of strikes by teachers in solidarity with protesting students. Likewise there have been calls for general strikes led by 'professional' workers such as lawyers, but it is unclear whether they were attended by workers more widely. We can say the same of the general strike called in Sfax - until more information is made available, it is hard to say to what extent it was observed. We know of strikes in the mining town of Gafsa, but again the scale of participation in these strikes is unclear. We do not know to what extent people have participated in organised strikes, or simply not gone to work due to the unrest on the streets. Lockouts after the state of emergency was declared would have precluded many strikes. Obviously the unemployed and students who have formed the bulk of protesters on the streets do not have labour to withdraw in the same way as workers. Demonstrations, blockades and riots all can form part of class struggle, and can advance it by disrupting the economy and drawing lines of confrontation. Radicalisation by police truncheons can often push confrontation with the state further, and draw more people into events by making the role of the state in maintaining order through violence clear. However, all major uprisings have involved mass strike action, and the mass strike is a means by which the common interest of proletarians as working class and their power to cripple capital by expropriating the means of life from it can become clear. The direction and scale of the insurrection is likely to be determined by the extent to which strike action spreads through the economy. Part of the explanation of our limited knowledge of strikes could be the focus of the media on street protests and the 'political' dimension presented by the calls to oust the current government. Strikes taking place in parallel may not be deemed newsworthy. On the other hand, it may be that there has not been generalised strike action. The role of tourism in Tunisia's economy, employing significant numbers of workers (half of the workforce is employed in the service sector) is not enough to account for this – industry such as manufacturing, mining and the oil industry accounts for a third of the workforce. This is the classic terrain for mass strikes of the kind that has been a feature of all historic working class uprisings, and this would have a significant effect in a major oil and minerals exporter such as Tunisia. On the other hand it is important to bear in mind the effect a drop in tourism revenues can have in a country like Tunisa – a few global headlines about rioting can lead to the paralysis of a major section of the economy. Ben Ali called on rioters to stop due to fears about the decline in tourism, and was clear and vocal about this. Nonetheless, a generalised strike movement would be vital in broadening a specifically class consciousness, widening the movement and radicalising the situation. Not a revolution – yet. The media has been quick to label events in Tunisia a 'revolution', and the name ' the Jasmine revolution' has been rapidly applied to bring it in line with a range of other political revolutions which ushered in new governments (usually pro-US) in various countries. Such events are only 'revolutions' in a political sense, with one government replacing another. Tunisa has not yet seen a true revolution, as the rule of capital and the fundamental balance of power between classes in the country has not yet changed. Such a possibility would require the working class of the region to draw lessons from the radical display of their own power which has unfolded over the past weeks. Given that the fundamental issues - unemployment, high prices and poor housing cannot be solved by decree by governments even if they wanted to, it is unlikely that we will see the status quo return in North Africa any time soon. Yes - thanks for this. Worth constantly updating this. Should also have mentioned Jordan. I've made some minor edits to this article for clarity. On the subject of strikes its also been made more murky by the response of that state and bourgeois elements - ie elements of the police looting, shops and workplaces being closed due to the street-level fighting and subsequent impact on producers. The sustained nature of the riots themselves would be responsible for significant economic damage well beyond tourism loss. Thanks Django. I started to do a timeline yesterday as well, but I'm glad someone beat me to the punch. I don't usually find texts from the ICC that interesting but this isn't bad. It's from a few days ago and they haven't caught up with the latest developments yet. When they do I'll actually be interested to see what their analysis is.